Study all the objects in Sherlock Holmes's apartment. Study all the pictures in the house of ill repute. Replace the stolen jewels with the rusty tableware before going to see Bluto. Hack off a pig's head. Find out what type of knife Jack the Ripper uses. Create a dummy that resembles Jack the Ripper. Find out the district in which Jack the Ripper lives. Fill in the 5 conclusion boards. 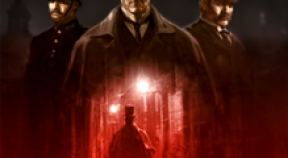 Reveal the identity of Jack the Ripper. End the Jack the Ripper investigation.